A chaotic first day of free agency is in the books, and contract details are starting to trickle in. A number of teams improved their prospects heading into the 2017 NFL season. Below, we break down the ten best deals. 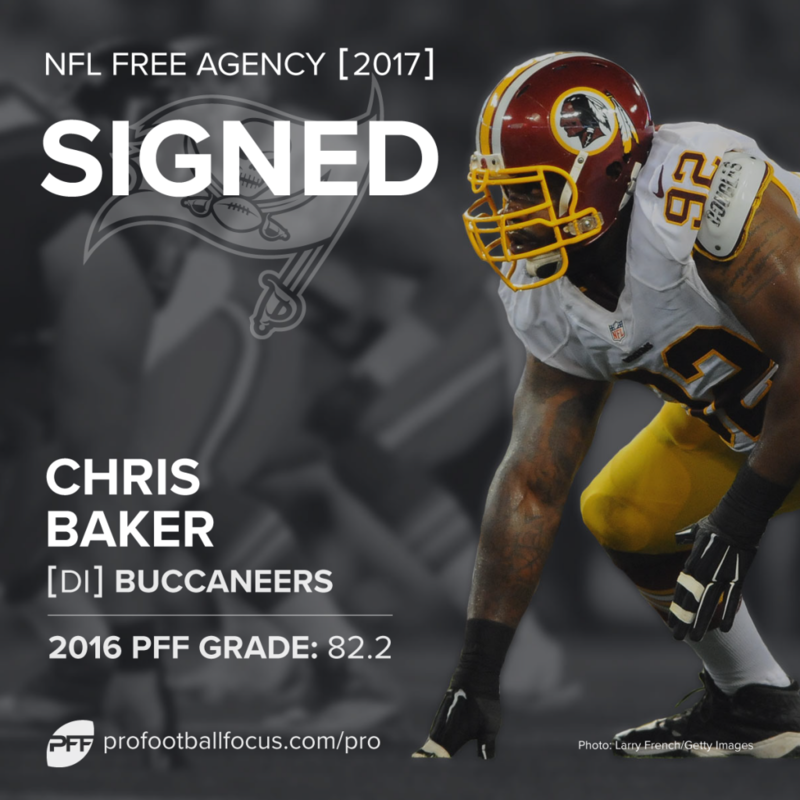 Largely lost in the shuffle yesterday, the Buccaneers added a quality defensive lineman on the cheap. While Washington replaced Baker with Stacy McGee, an inferior talent, Tampa Bay may finally have a solution to the defensive tackle spot next to Gerald McCoy. Baker registered six sacks, six hits and 30 hurries a year ago. At only $5 million per year, the Bucs have stolen an impact starter. 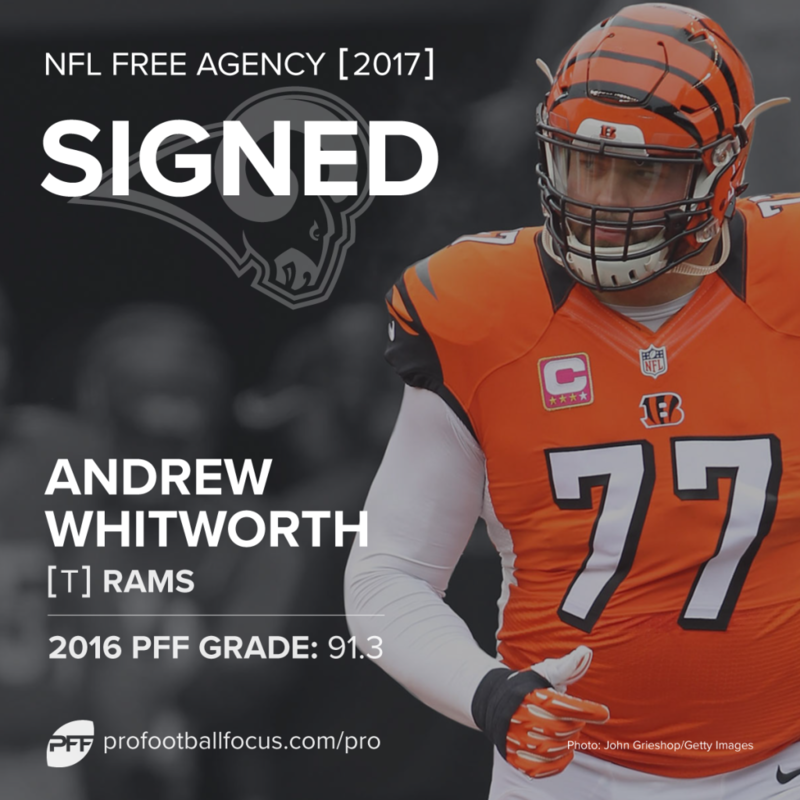 Whitworth opted against ending his career as a Bengal, choosing instead to secure an unprecedented deal for a 35-year-old free agent. The NFL ironman shows no signs of slowing down. Logic would suggest a regression is inevitable, but you wouldn’t put it past Whitworth to remain one of the league’s best tackles until the third of his three years, when he can be released with few repercussions. In essence, it’s a two-year, $20 million deal. Whitworth is down at 10th in average dollars per year among offensive tackles, and outside the top-30 in guarantees. It’s a great contract for one of the league’s best veterans. Unable to compete financially to sign Jeffery to a long-term deal, Howie Roseman came up with a creative solution to ensure second-year QB Carson Wentz has a viable No. 1 target in 2017. Jeffery changes the outlook of the Eagles’ offense significantly, opening up the vertical game. Head Coach Doug Pederson appeared reluctant to expand his West Coast offense, but he now has the personnel to generate big plays more consistently. Jeffery has excellent hands to make grabs in traffic underneath, and the body control and size to come down with the deep ball. 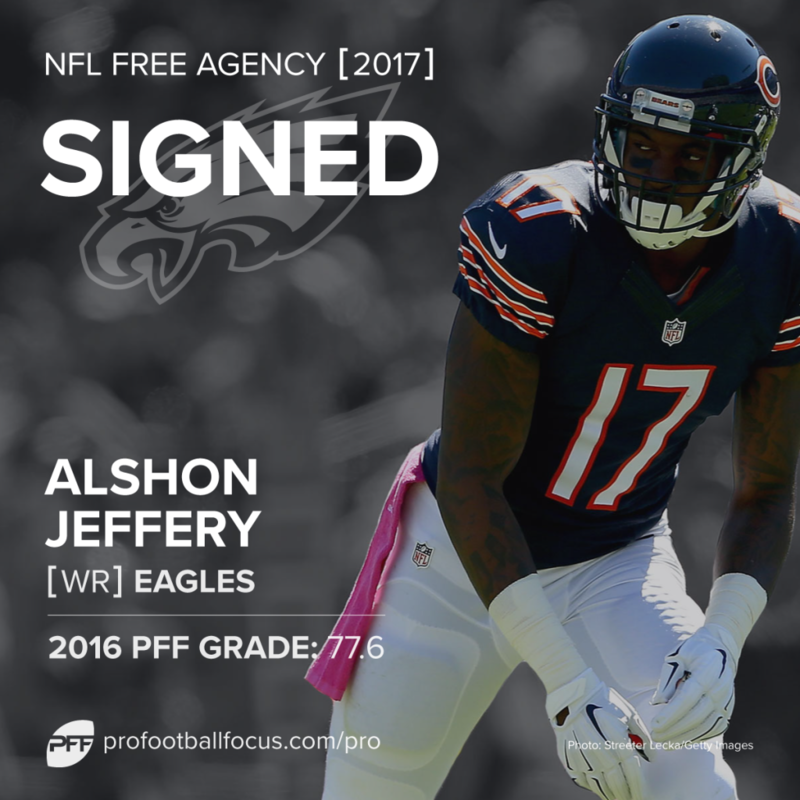 Although only a short-term solution, Jeffery will make a huge impact, assuming he stays free of injury and suspension. The overlooked member of the Cowboys’ dominant offensive line, Ronald Leary kept La’el Collins on the bench for the entirety of last season. He is a mauling run blocker, yet balances his physicality with finesse. Leary allowed only three knockdowns and 21 combined QB pressures in 2016. Considering the deals signed by Joel Bitonio and Kevin Zeitler in Cleveland, Leary’s deal appears to be of excellent value. Mid-level deals like this one often produce the biggest payoff, and Denver was desperate for offensive line help. Nick Perry perfectly illustrates the value of patience with young pass-rushers. Although it took him five years, Perry finally lived up to his status as a first-round pick. Much like Whitney Mercilus in Houston, it seems to have taken him an age to develop. Although $12 million per year exceeds the contract of a handful of superior pass-rushers, the Packers can expect Perry to continue to improve. Green Bay also has plenty of flexibility, handing the outside linebacker only $18.5 million guaranteed (13th amongst edge rushers). The franchise’s model is built on retaining its talent—the Packers have achieved that goal in Perry’s case. Harmon succeeds because he is confined to a limited role in New England. Returning to the Patriots ensures he can continue to thrive. Lining up deep in the secondary on 573 of 617 snaps, Harmon is able to influence plays using his range. He is rarely asked to compete with receivers in man coverage, instead using his instincts to read the quarterback and cover sideline-to-sideline. Harmon has notched nine interceptions in his four NFL seasons, despite facing only 33 targets. Dirk Koetter simply couldn’t resist adding another playmaker on the perimeter in free agency. 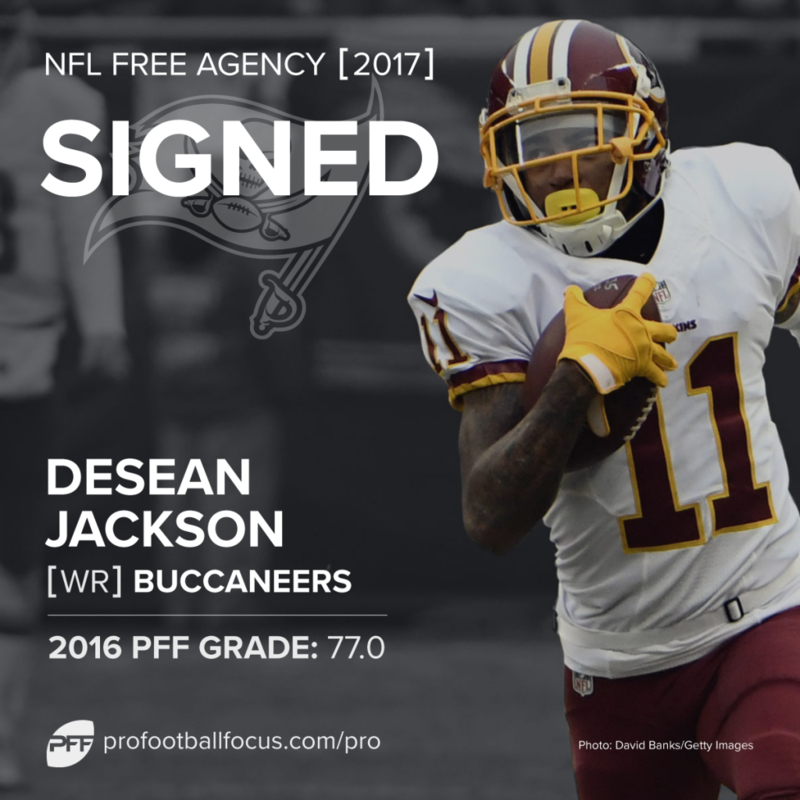 Few secondary’s have the range of skill-sets to cover both Mike Evans and DeSean Jackson. Although obviously one-dimensional, Jackson’s speed changes games. He did not enjoy the best season of his career in 2016, and is now 31, but still managed 17.9 yards per catch and over 1,000 yards. The contract is probably verging on the expensive side, though Jackson may be worth it given the way he influences defensive gameplans. Cam Erving has been setting the benchmark for disastrous center play since his selection by the Browns at 19th overall in 2015. He has allowed more sacks (nine), hits (eight) and pressures (47) in two years than Cowboys center Travis Frederick has allowed in his career. Tretter, meanwhile, has impressed when healthy. He ranked ninth amongst centers with an 84.1 grade despite managing only half a season in 2016. The new regime in Cleveland clearly believes investing in the offensive line is essential to success (adding Kevin Zeitler, re-signing Bitonio)—now they will be desperately hoping Tretter stays on the field for the entirety of 2017. The Dolphins needed to replenish the depth on their defensive line, and they did so with the addition of the unheralded William Hayes. He counts only $5 million against the cap in 2016, a reasonable figure, and the Dolphins lost only a couple of draft spots by trading a sixth-rounder for a seventh-rounder. Over the past five years, Hayes has been one of the most consistent players in the NFL. He has 29 sacks, 32 hits and 118 hurries in that span, never registering fewer than 24 combined QB pressures in any season. The Dolphins acquired a quality rotational end despite giving up very little. To be very clear, this is an exceptional move for Cleveland—not for Houston. While the first offseason under the new Browns’ regime produced mixed results, their second effort appears very promising. The team acquired Brock Osweiler’s contract ($16 million cap hit) in exchange for a swap of fourth- and sixth-round picks this year, and a 2018 second-round pick. While the move appears disastrous from the Texans’ perspective, as colleague Sam Monson noted this morning, the Browns will be ecstatic to add another two picks to their bag. Clearly the front office has committed to a rebuild whole-heartedly. The Browns have been reluctant to hand out many major contracts to free agents thus far, stockpiling cap space instead. In addition, they’ve found a way to sacrifice that financial flexibility now for future high draft picks. Quantity is the priority over quality of draft capital within the Browns’ organization, highlighted by the hoard of picks they received for trading down in 2016. Although great in theory, the Browns cannot sacrifice short-term gain forever. They need to hit on some significant selections soon.